Learn to eat with your eyes. The Japanese General Consulate in Frankfurt will let you take a glimpse at the rich culinary culture of Japan with the two specialities of sushi and takoyaki. 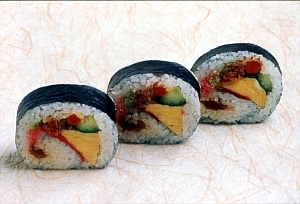 Maki-sushi, the combination of fresh raw fish and vinegared rice, rolled in sea weed, is probably the most famous Japanese dish. Here you will have the opportunity to make the delicious sushi rolls by yourself under the instruction of experienced sushi masters. Aesthetic skills are also required for takoyaki, little dough balls filled with octopus and served in a savoury sauce. Originally from Osaka, they are today popular in the whole of Japan. But take heed: the little takoyaki balls have to be perfectly round! Once all the delights are prepared, you might also involve your mouth in the eating process.